Growing up in Weymouth, Massachusetts, Kate Rogerson knew she loved Boston sports teams. 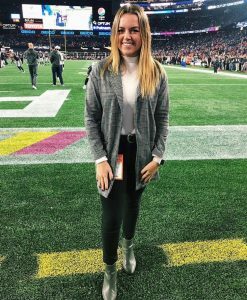 She did not know one day she would find herself reporting at Gillette Stadium, home to the New England Patriots football team. Rogerson is a junior journalism major pursuing a minor in sports media in the Harrington School of Communication and Media at the University of Rhode Island. Through her internship course, Rogerson serves as a news intern for WLNE ABC6 in Providence. On Mondays, she goes with the station to Gillette Stadium to conduct interviews and shoot footage in the locker room. Rogerson travels to Gillette again on Wednesdays to sit in on press conferences with players and coaches. In the conferences, she records audio and takes notes. Rogerson spends her Fridays traveling throughout Rhode Island to cover high school football games. She shoots film, puts together highlights and writes scripts. Rogerson packages all this information together, and it is broadcast on ABC6. A longtime Patriots fan, Rogerson says that working with ABC6 was everything she was looking for in an internship. “Eight-year-old me is screaming on the inside, and I’m still screaming,” said Rogerson. Rogerson applied for the internship with the help of one of URI’s career education specialists at the Center for Career and Experiential Education (CCEE), which offers job and internship assistance for current students and alumni of the Harrington School. Rogerson believes the courses she has taken in the Harrington School have prepared her for her current internship and future career. Rogerson was quick to point out that one particular course helped prepare her for her sports internship. Next summer, Rogerson hopes to get another internship in sports broadcasting in the Boston area. After graduation, she plans to search for a job in the field of sports, either as a sports reporter or broadcaster.